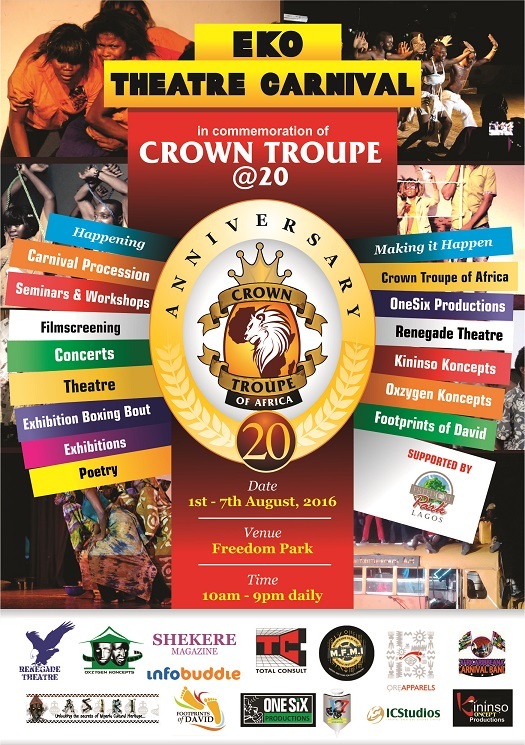 Crown Troupe of Africa is a youth focused group that engages in the arts of Dance, drama, music and visual arts. As part of events lined up to celebrate the attainment of this milestone age, the Troupe has just completed its tour of some Nigerian Universities (Lagos State University, University of Calabar and University of Abuja) with “Love at War” an adaptation of William Shakespeare “Two Noble kinsmen” from February till April. From May till June, Crown Troupe also produced “As E Dey Go” an adaptation of Bertolt Bretch’s “The Exception and the Rule” which premiered at the Lagos Live Festival. The anniversary celebration comes to an end with a befitting Theatre Carnival in the first week in August. The Eko Theatre Carnival formerly known as the Bariga Open Air Theatre (B.O.A.T) Festival is a performance based carnival that celebrates Artistic excellence and our collective belief in the Art as a viable tool for social engineering and empowerment. The events for the carnival include, seminars, workshops, Theatre, exhibitions, concerts and award ceremony. 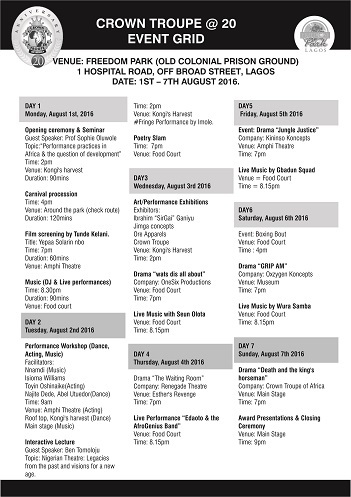 The Eko Theatre Carnival will be presented for 7 days and will parade some of Nigeria’s finest performers. “The Eko Theatre Carnival” will be viewed live by an attendant audience projected at 3500 and reach over 10,000,000 million people worldwide via media partners and various social media platforms. The carnival will kick off on Monday 1st to Sunday 7th August 2016 and will take place at Freedom Park (old colonial prison ground), Lagos.